If you have been hurt in an accident, through no fault of your own, you are entitled to seek financial compensation from the at-fault party. As your experienced injury attorney in Erie, North East, and Corry, PA., Damon C. Hopkins will fight to see that you receive the best recovery possible to compensate for your pain and suffering, medical bills, and lost wages. Also, if you were involved in an accident and were injured or suffered property damage, you may be eligible to file an insurance claim and obtain financial support for your losses. Contact Damon Hopkins today and schedule your free consultation. Have you been seriously hurt in an accident? If so, you need an experienced litigation and injury lawyer. Let Damon C. Hopkins put his years of experience handling jury trials to work for you. The insurance companies have one goal in mind, that is to keep as much of their money away from you as possible. As an insurance claim attorney, Damon C. Hopkins will fight to make sure you get every dollar that you deserve to compensate you for the pain, suffering, discomfort, lost wages, expenses, and aggravation that comes from being seriously hurt in an accident. Personal injury cases can occur from nearly any type of accident. Before accepting a case, your accident attorney will learn the fine details of your situation and determine if you have grounds for pursuing legal action. If you do, Attorney Hopkins will explain every step of the process, go over your injury rights, work with your doctors to be sure you’re getting the care you need, and actively help you through every stage of your injury claim. When it comes to auto-accidents, you will want to make sure to enlist the help of an experienced personal injury lawyer. Choose Attorney Damon C. Hopkins to fight for you and your rights against the insurance companies. If you are hurt in a car accident and are located in Erie County, including Edinboro, North East, Corry, Girard, and other surrounding townships, Attorney Hopkins may be the accident lawyer you need. If you believe that you may need to file an insurance claim, you should contact Attorney Damon C. Hopkins. 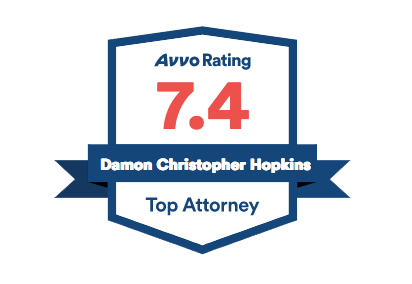 At Damon Hopkins Law, if we never recover any money, you don’t owe me anything for my legal services. Call my office today to schedule a free consultation on your personal injury case. How Do I File for a Personal Injury Lawsuit? Suffering an injury can be a traumatic experience, one that may leave you feeling as if there is nowhere to turn. Filing a lawsuit on your own can be a daunting task, as you will not only have to determine which theories of law apply to your case but also gather evidence, review medical records, and take care of all the paperwork on your own. This can be a recipe for disaster. That is why the skilled personal injury attorney, Damon C. Hopkins is here to help you understand your legal rights and discuss the available options with you. What Factors Determine how much my Personal Injury Case is Worth? The factors that determine how much a personal injury case is worth vary widely. They can be anything from the number of injuries you suffered to the degree of negligence by the person who’s injured you. It’s difficult for any personal injury lawyer to tell before they start to investigate a claim how much this case is worth. What if no one is “At Fault” for my Personal Injury? The first thing we look at when evaluating a potential personal injury case is whether there any liability by anyone. There are many different investigative items to determine if someone is at fault. There are experts we can talk to, witnesses who may have seen something not apparent, or other responsible people (owners, employers, manufacturers, builders, etc.) We take all cases very seriously from the moment they come to us and we want to get on top of the investigation right away. We will track down the needed people, get records requests, and make sure that if somebody is responsible or there is a chance that somebody is responsible, we can find out. Negligence– A negligence claim is the most common type of personal injury case. An individual is considered negligent when they fail to act with at least the same degree of responsibility that an ordinary person would reasonably use in a similar situation. Intentional Torts-An intentional tort is a willful act that caused you injury. An example would be someone who assaults you during a mugging, resulting in you being harmed. Strict Liability-In a strict liability lawsuit, you can win without proving that the defendant was careless, reckless, or acting in an intentional manner. Yes, you can. The jury will determine the percentage fault of the parties. Your recovery will be reduced by the percentage found attributed to you. However, if you are more than 50% at fault, you may not recover for your injuries. If I Hire a Personal Injury Lawyer, How Likely will my Case go to Trial? Whether or not your case proceeds to a trial in front of a jury depends on a number of factors including the insurance company that is representing the defendant, the specific facts of your case and whether or not liability is disputed among different parties. Most cases will settle before they reach a jury verdict. In fact, the vast majority of cases will settle either before a suit is filed or before a lawsuit is actually tried in front of the jury. Does it Matter what Type of Attorney I have for my Personal Injury Case? Absolutely, there are a number of attorneys that will take on personal injury cases even if they do not handle personal injury cases exclusively. This can lead to the client getting subpar legal services. How Long Do I Have to File for a Pedestrian Accident Case? The amount of time you have to file a claim for personal injury arising from a pedestrian accident is determined by the statute of limitations. For personal injury cases, the amount of time is usually two years from the date you were injured. However, you shouldn’t wait that long to talk to a personal injury lawyer.